As I progressed as a photographer, and spent more time observing other photographers as they were taking pictures, I noticed a strange phenomenon. They would point their lens at their subject, press the shutter down half way and then move their lens again before taking the picture. At first I wasn’t sure what they were doing as it seemed strange. It was as if they were focusing twice. As time progressed I found out that they were locking focus the first time and then recomposing their shot while they kept their finger pressed half way down on the shutter button. Why would they want to do this? When I look at many of my first photos, they are pretty good but everything is smack dab in the middle of the frame. There is something about moving the subject to the left or right that appeals more to the human eye. I can’t really explain it fully but there you have it. Does that mean that I never have a picture with the subject right in the middle of the frame? Of course not! This is acceptable, especially in portrait photography, but not something that should be done all the time. Many cameras let you have a grid visible in the viewfinder or on the LCD on the back of the camera. I highly recommend this. 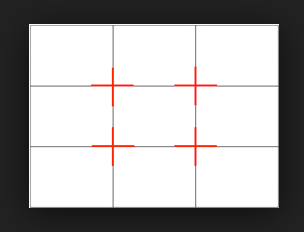 If you choose the 9 point grid it looks like a “tic, tac, toe” board is overlaid on your screen. This makes it easier to use the “rule of thirds.” Simply put you subject in one of the places where the lines intersect. You can do this by recomposing or you can do this later in post-production by cropping/moving your subject. Personally, I prefer to get it right in the camera if possible. I wish I would have known this when I purchased my first digital camera four years ago. Then again, one of the best things about photography is that I will never know it all. There is always something new to learn. I have posted some examples below showing the difference between a portrait view and a view using the “rule of thirds.” I hope this helps. I labeled the last one “incorrect”, and this is my personal feeling, because I tend to give more space in front of the direction the subject is facing. The second pic gives more room to her left. The last one does not and puts her too close to the left edge of the frame.